Posh boss Grant McCan's job is safe for now. Manager Grant McCann will be given until January to turn Peterborough United into League One promotion contenders. That was the biggest news to come from today’s (April 11) exclusive and wide-ranging Peterborough Telegraph interview with Posh chairman Darragh MacAnthony. 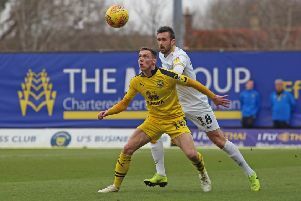 MacAnthony remains a huge fan of McCann and is confident he will succeed, but he will not let sentiment get in the way if Posh don’t improve next season. The full interview can be viewed via the Peterborough Telegraph’s Facebook page and will appear in more detail in Thursday’s (April 13) printed edition of the paper. The other main points to come from the interview include the appointment of former Posh player David Oldfield as assistant manager to McCann on trial for the rest of the season. Oldfield has occupied a similar position alongside Jimmy Floyd Hasselbaink at Burton Albion and QPR. David Oldfield is working as assistant manager to Posh manager Grant McCann until the end of the season. MacAnthony expects both Marcus Maddison and Michael Bostwick to be placed on the transfer list as they enter the final year of their contract next season. MacAnthony insists progress is being made on buying the ground back from Peterborough City Council. Michael Bostwick is about to enter the last year of his Posh contract. Posh chairman Darragh MacAnthony does not expect Marcus Maddison to sign a new Posh contract.